Morality follows function and Bitcoin has made selective divestment a lot more functional. When it comes to the qualities of crypto-currencies the majority of attention is given to its technical foundations when the most disruptive quality may be the most simple and obvious of all. The most subversive effect to come from crypto-currencies will not be through deflationary qualities that fly in the face of central banking or preventing too-big-to-fail policies. It wont come from low fees that make micro-payments possible or its protocol that makes the financial services industry redundant. It wont be from providing a more democratic storage of value. It will not come through making you rich. No. Crypto-currencies greatest impact is going to be the ability of individuals to partially choose the economy they function within. Gone are the days when collectives demonstrate the “right of might” that Einstein and Freud eluded to in their era. 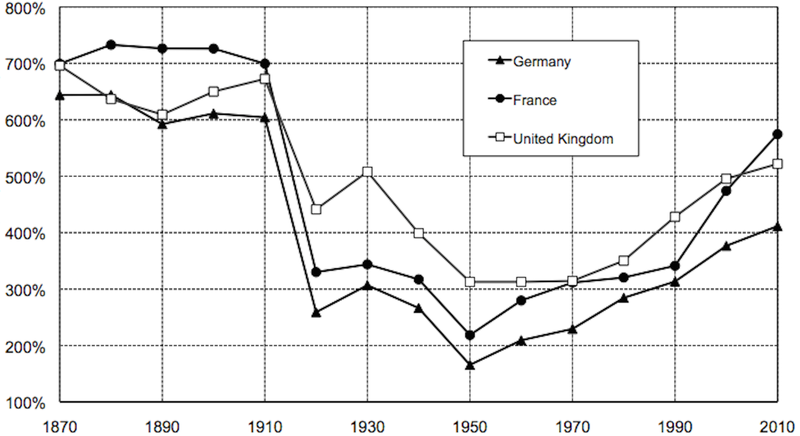 The #1 book selling on Amazon right now, Thomas Piketty’s Capital in the 21st Century, shows (in chart above) that the centralisation of wealth partially responsible for the rise of foregone socialist and communist movements has mostly recovered with wealth as centralised today as it was then. Yet the collectives that organise today (i.e. the Occupy movement) do so without the the might of then. Why? Without getting too deep into the wealth-disparity debate I argue that the time for “right of might” in the street has passed because capitalism is actually effective in appeasing the majority. This can be seen in the handling of the recent economic crisis where in some places the defacto store of value for the middle class, housing, was considered too-big-too-fail and action was taken to protect it. Despite the well-being of the majority the wealth debate continues because of conscious concern for the minorities left out. It just happens now without the pageantry of fire and picket. Today the will for might is placated by a once-in-every-4-years vote, the comfort of opinion collectives that provide physical or digital “i support xyz” wristbands or gets filtered into emotional but meaningless arguments carried out through polar opposite news corporations. News consumption is the processes of choosing an ideological team to cheer for but as a result ideology becomes a spectator sport and we cannot do much other than cheering. Or can we? News consumption is the processes of choosing an ideological team to cheer for with the result being that ideology becomes a spectator sport and we cannot do much other than cheering. The placation of the majority is a natural and positive effect of stability. With that the execution of might is more subtle and action will be more granular (able to choose when to act or not) and more accessible. In modern design it is said that form should follow function. This applies to morality and idealism as well. In design this statement implies that when creating a door any modification or addition should have function — itself closely tied to intuition. For morality I apply this to mean that any desired action of an ideal must be within intuitive reach. Humour me: More people act on concern for the environment due to wider accessibility of recycling bins. Greater accessibility enables more widespread action. But the ability to selectively act provides an even broader compound effect as wider adoption leads to more exposure. You may recycle when at home but are less likely to do so when walking down the street. An “activist” may criticise such inconsistency but this criticism is our religious gene getting the better of us. In-fact this impurity leads to broader adoption of the ideal itself. When you do recycle your child will become exposed to the question. If forced to consistency function dominates with people likely abandoning the ideal all together. It is both accessibility and choice of when to and not to participate that is powerful. This is what crypto-currencies provide in a new way. We understand that the tax we pay directly supports the actions of the government we pay them to. This has been a constant for so long that anything but moral indifference to the act makes one appear departed from reality. Questioning this constant requires such effort that it is not possible for anyone but the most rich. This is unlikely to change. But the use of a governments currency also provides support for their actions. By how much I could not say but for the first time in history we can choose to sometimes not provide that support. With crypto-currencies this option has become more accessible than ever before. This is action through exit rather than vote. To understand this take the Palestinian/Israel conflict as an example. The entire population in the Palestinian Territories use the Israeli Shekel as their base currency. Not only but Palestinians pay their taxes directly to Israel which can use their discretion in withholding these funds. The interest for an alternate economy within this group would be very strong. Further, there are many Israeli-Arabs (%20 of total population) that more directly identify with the day to day hardships that Palestinians are faced with. Add to this many left-leaning organisations of non-Arab Israeli’s and you are presented with a large collective that would all be interested in selective divestment from the Israeli Shekel. Boycott is one thing. Sanctions are another. But choosing to selectively participate in an alternate economy from one you disagree with in the same manner you choose when to recycle a can is a matter of convenience but none-the-less powerful. What do I mean by “selective”? I figure I eat at a restaurant about 4 to 8 times a week. For the foreseeable future I will eat at a Bitcoin accepting establishment at least once a week. I encourage you to join me (Berlin, Zurich, Jerusalem — when i’m there). You can perceive this action as no more meaningful than wearing a cure cancer wristband. In some sense it is exactly that. Such selective action makes me feel better. But with crypto-currencies it does have actual impact on some governments actions. tl;dr Have a cause? Riots are yesteryear. Make any action accessible or forget it. Crypto-currencies present new methods for partial and selective protest. “Using One Dollar Funds One Electron Of A Drone.” Building minor alternate economies from within is as selfish as wearing a “i support xyz” wristband but with actual impact.